WHAT SHOULD YOU DO IN AN EMERGENCY? 1. Be aware of your surroundings. Being aware of where you are and what is happening around you can help you to understand how information events, and your own actions will impact your safety and your ability to protect yourself, both now and in the near futures. 2. Protect Yourself. Based upon your assessment of the situation, use your best judgement to protect yourself and, if possible, others. 3. Call for help. Any emergency service can be summoned by calling 911. 4. Help Others. Once you are safely away from the danger, warn others of the hazard and help if you can without putting yourself in danger. 1. Give your name, location and phone number. 3. Do not hang up until asked to do so. 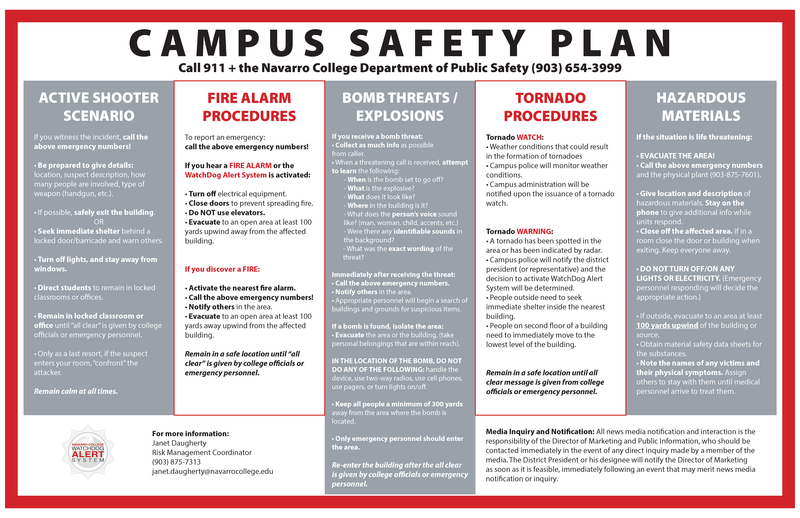 Look for information from your WebMail, Twitter, Facebook, Navarro College website and local media sources.